SEMA Hall of Fame - Sandy Belond, 1981, Belond Mufflers. Sandy became famous for his line of performance exhaust systems that included dual kits for both flatheads and OHV engines of the late 1950s and early 1960s. His love of racing inspired him to build and maintain a drag strip, Carlsbad Raceway, in Carlsbad, California. But Sandy began racing much sooner—in 1938, he hit the dry lakes; his roadster was one of the first 100 cars to nail a land speed of more than 100 mph. 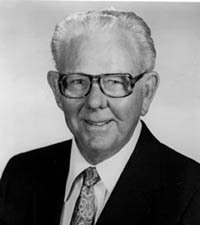 He was also a founding board member of the Western Timing Association. Later, his muffler company even designed for the OEMs; his company became such a success, he built a steel mill near Los Angeles to founder his own exhaust tubing.